Are you new to the marketing and communications field? Do you have experience in other industries but decided it’s time for a change? Or, maybe you just finished school and looking to enter the field for the first time. No matter what your story is, the IABC Minnesota new professionals events are for you! 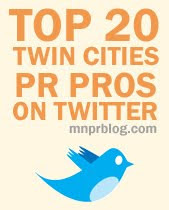 Join us for our first networking event of 2011 designed exclusively for new professional communicators, sponsored by CenterPoint Energy and located at Mission American Kitchen in Minneapolis. The topic for the April 6 event is crisis communications and two IABC members will talk about their experiences in crisis communications. Rebecca Virden, public relations spokesperson for CenterPoint Energy, will talk about crisis communications and how the company helped as first responders during the 35W bridge collapse. Rebecca will also speak on the importance of having a crisis plan in place in order to respond to events like gas explosions, floods, and others. Antoine LaFromboise, spokesperson for Target and IABC Minnesota board member, will speak on his experience in corporate crisis communications. Antoine is a great testament to the value of the IABC Minnesota network. He was offered his first post-college position after connecting with people at his first IABC Minnesota event and continued networking throughout his job search. If you’re new to the field and are looking for an opportunity to connect with others in the same boat, or to just see what it’s all about, the new professionals events are the place to be. Visit the IABC Minnesota events calendar for more information and Register Now!